During the construction of a house from the beginning to the ending stage, the first thing that comes to your mind is flooring and tiling. It’s very important you put the aspects of flooring and tiling in consideration to have a perfectly furnished house. You might be thinking of how much the cost of floor tile per square meter is before starting on the building project. 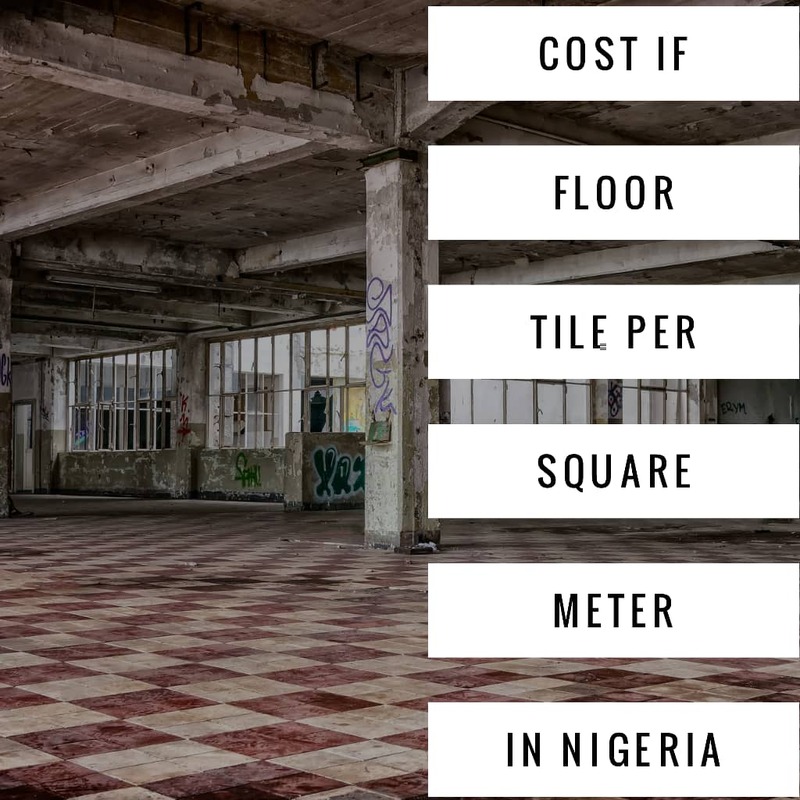 The cost of floor tiles per square meter in Nigeria is equal to the type of tile, size as well as the area to be occupied. Therefore, prices of floor tiles per square meter will vary. Floor tiles come in different sizes and types. Not all floor tiles are used in the same place. There are some types used for sitting room as well as some used in the toilet and bathroom. The floor tiles used for sitting room mainly provide a designable and creative expression of interior design in shape and color and its give good beauty to the sitting room for you to admire. The reasons for those that are used for toilets and bathrooms generally have a good and firm grip on the feet and are gritty to combat the issue or problem of occasional wetting and also to stop home accidents like falling, sleeping and so on. Tiles are mainly sold per square meter with the number of square meters showed on each carton for you to know what you want to buy or what you do need to buy. Once you know the square area of the floor or wall to be tiled, then you can be able to decide on when to split or divide that square area by the given square meter showed on the carton. That is how much you know the quantity of carton needed for tiling the floor and that you get to know what to use or not what to use. The main reason for beautiful flooring cannot be overemphasized because it needs to look good and also looks beautifying. But most time it might not be the first thing you notice or see in the house, its well among the main thing that decides the class and beauty of a building. That been said, no one talks about the beautification for a floor without naming floor tiles. The reasons for floor tiles have gone beyond the beautification of a house; they now have a perfect way of making the house feel like a “Home” solid and warm. In the aspect of the architectural field of nowadays, floor tiles are gaining more usefulness every day, and it is mostly now used around when building houses. Whether in the hotel rooms, service rooms, malls, office, airports, living room, a floor tile help in making a big show and radiates class of their own. Floor tiles especially come in square blocks and some they have different shapes. They are made from different types of material which include ceramics and stone, and ceramics consist of crystallites. In Nigeria, the most common types are ceramic, and they are found in different sizes. It is showed and noted to everyone that tiles are picked based on the type of rooms. For instance, you won’t expect to floor your kitchen or bathroom with some slippery tiles because the first things that will come to your mind are accident problem and you can’t get a better one to be accident-free. Instead, you can go for the materials that are less slippery. As for the rule of thumb, it is compulsory to buy an extra 10% of the total cartons to cover for any damage or offcuts because you are not buying it will slow the flooring down when there is damage. Visitors Also Read : Does the Past Annual Revenue in the Real Estate Industry Impact the Future? One must put into consideration the benefits and effects of each type of tile as well as the finishing of the tiles, in the procurement of tiles. Tiles vary so also is the cost too. They come in different sizes and different shapes. The common ones are 30 by 30; 40 by 40; 60 by 60; 25 by 40 among others. Having known the total area, you need to cover with tiles is the first step to take when flooring the ground with tiles. This spot could be in square feet or square meter. You will then need to multiply it by 0.09 to get the corresponding measurement in the square meter if you calculate the total area in square feet. Next to do on the list, is to get a sample tile before the cost of the tile per square meter can be decided. Other materials required for installation or downloading are bags of cement, pans of sand, packets of white cement (tile cement) and of course the quality of the tiles depending on the square meters of the area to be tiled because artistry does not charge just because he /she want to tiles the floor. What you should procure and know is that, if you want a tile made out of glazed porcelain and matt finishing with low water absorption, then you can be talking about Spanish tiles. They can be used in homes, offices, government and projects flooring. They are strong in hardness and also have good coordination in color and luster. Deluxe clubs and lush wall tiles also install Spanish tiles for their simplicity, class, elegance and splendid colors. They are available in various sizes and colors and are sold in standard carton and pallet. Spanish tiles are known to have resistance to thermal shock.